Wearable electronics are expected to revolutionise the way we live and work. In this article, Dr Georges Kotrotsios addresses how smart watches and developments in technical textiles and can be harnessed to protect industrial workers. I wrote last for this publication three years ago on the topic of the evolution of textiles, in particular, the shift in technology from passive protective shields to active devices. Since then, quantum leaps have been accomplished by technologies in the domains of photovoltaics and nanotechnology. In parallel, complementary technologies are now coming into maturation. Wrist worn devices, labelled as connected watches or smart devices are now on the market from incumbent grand vendors and new ventures alike. Whether looking at the evolution of large area systems or wearable devices, or their coexistence, along with the basic technologies developed in the years before, each one of these two trends allows for the emergence of power tools for the protective apparel industry. Such protective apparel goes beyond textiles; it extends to wearable protective systems. In the following paragraphs, I will attempt to address the potential of each one of them, as well as their coexistence and combination. The term large area device encompasses a number of technologies, including flexible photovoltaics (PV), displays and large area sensing devices. The traditional PV continues on a steady path towards increased market penetration in the traditional application of energy generation, either at industrial level or for residential use. While other colours exist, the recently introduced white PV panels are expected to induce a strong increase in the market’s acceptance of PV, which in a virtuous economic cycle will in turn further push a reduction in their price. Two main trends expected to be integrated appeared in the PV industry. The first is traditional inorganic PV. These high efficiency devices can operate at low light and are also known as heterojunction devices. There is a very simple idea, albeit not simple to realise, which is to exploit a larger part of the spectrum of light coming from the sun or other luminous sources. This disruptive change allows flexible PV systems to become more efficient and as a result wearable devices to come closer to being commercial. In an anti-diametrical direction, another type of energy recovery device is the organic photovoltaic (OPV) flexible device, see Figure 1. Development of OPVs gained significant momentum in recent years, while commercial companies such as the Brazilian Sunew started operations. We use the term ‘antidiamatrical’ because, as opposed to heterojunction devices, OPV does not struggle to increase efficiency. Despite a low efficiency, its considerably low cost means it can be adapted to the needs of the apparel industry, and protective apparel in particular. Also very interesting is that, as with the hererojunction systems, OPV tends to operate well in low lighting conditions such as indoor environments. An important factor that will contribute to the successful introduction of PV devices on wearable systems in the coming years is the parallel development of flexible battery devices. It would have been expected by many that the fast growing industry of computers, televisions and smartphones, as well as smart watch displays, all based upon OLED technology, would be the basis of displays for wearable systems. This may be the case in the medium to long run; however, a current weak point of OLED technology must first be addressed before it can become fully wearable: atmospheric oxygen when in contact with the organic molecules destroys them and induces accelerated ageing, which can rapidly degrade the light emitting performance. To avoid this phenomenon the chemical industry is actively working on the development and commercialisation of good barrier layers, however, this is a somewhat daunting task. In the consumer goods industry, to allow commercialisation, OLED systems are packaged between glass, which is an excellent barrier for oxygen molecules. Alternatives come from completely different fields. One alternative under development, coming again from the consumer goods industry, is the use of quantum dots. The huge problem of such devices is their environmental compatibility: cadmium ions are a key component of today’s quantum dots. For quantum dots to become environmentally acceptable, cadmium ions need to be substituted, and this is on the way. Protective coatings for use in industry, however, do not need the resolution of displays that are sought in consumer devices. The role of the display is most often that of alert, for instance as optical or acoustical feedback from changes in the direct environment of the worker, such as methane in the mining environment. In such a case more rudimentary colour change is sufficient, rather than what we would usually call a ‘display’ nowadays. Excellent solutions exist and can be integrated directly into textiles. As seen in Figure 2, a viable solution with sturdy characteristics comes from quite an old technology: electrochromic materials. 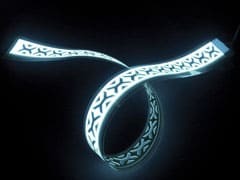 Electroluminiscent materials that can be deposited in flexible substrates, usually polymeric and integrated into clothing. Integration into apparel has been nicely demonstrated for consumer applications covering professional building or apparel. An electrical voltage is used to drive the lighting of the system. Electric power is provided either by a local battery source or by using a flexible energy storage device that delivers the previously stored energy. As an alternative solution, the direct colour change of large area surfaces as a result of modifications of parameters can be monitored. Nanostructured materials are a good fit for some of these cases. The principle of operation is simple. Nanocrystaline materials with a given crystalline structure and periodicity only diffract light at a given wavelength. Each wavelength corresponds to a colour and the human eye sees only this colour. Absorption of the measurand (the element that we wish to monitor in its gas or liquid phase) modifies the crystalline structure. The wavelength (i.e. the colour) that is diffracted changes, because the crystalline structure swells and therefore the human eye can easily discriminate the visible change, which corresponds to the presence of the elements that had to be detected, as seen in Figure 3. Such materials can and have been deposited in patches and thoroughly tested in medical applications such as wound monitoring. This is an example of how a simple device can be used to directly ‘display’ changes in a person’s external environment, thereby preventing exposure to increased hazards. A third element that contributes to the transformation of professional protective clothing is the fast evolution of large area sensing devices. As mentioned previously and as seen in Figure 4, materials engineered at the nanoscopic level can provide low cost solutions. To illustrate this, take gas sensing devices as an example. Materials such as ruthenium, for example, can change their optical properties under the presence – or absence – of gases, e.g. oxygen or carbon dioxide. Of course, other chemical substances can interact with other gases, for instance, optical absorption and fluorescence properties can change over their lifetimes. The problem is that these effects are relatively weak and usually require heavy instrumentation to be monitored. Such heavy instrumentation is not compatible with wearable or at least portable systems, which are needed to protect workers. Here is where nanotechnologies bring a breakthrough. By properly engineering the porosity of materials, the integration of the material that allows the presence of the optical change effects can rapidly become more efficient, by one or two order of magnitude, which, in turn, allows the practical use of such systems. The manufacturing process is simple and has low costs, as it uses processes originating from self-assembly. Such devices can therefore be compatible with relatively large surface productions, typically covering a large part of a protective garment. Not to forget that these devices can also be disposable due to their low manufacturing costs which opens totally new application fields. The importance of the large area is not connected to its sensitivity, as sensitivity increases by exploiting the porosity properties of the patch. The importance of the large area has to do with two factors. The first is the visibility of the optical effect and the mechanical tolerances when an external optical source is used to stimulate the optical effect such as absorption or fluorescence. When an external source is used it is better to have low cost, large illumination angle devices such as LEDs instead of lasers, which tend to be more expensive and have a small diameter parallel beam. This needs to be precisely directed and impact only on a small area, which can in some cases be less visible. As an alternative one could use defocusing optical components, but this increases cost and complexity. In practical terms, this sensing system means that the person to be protected has a sensitive patch built into his/her garment. This can be large, as the production process seems not to be a particularly limiting factor in terms of costs. Optical sources are then either external or integrated into the garment, allowing the worker and his/her colleagues to either see colour changes (i.e. absorption or fluorescence) or, with slightly more sophisticated detecting devices, the wearer can measure the time of fluorescence, which in turn gives more detailed information for the quantity of the measurand (e.g. gas or liquid) that they wish to detect. After several years of anticipation, a number of wrist devices have finally come to the market. What can be the impact of this trend on protective apparel? The answer is communication and intelligence, when this is needed. It can also provide information on the wellbeing of personnel conducting hazardous activities, through monitoring the pulse and peripheral capillary oxygen saturation (SpO2). Obviously this is not needed in all cases, for example, a wearable methane sensor for use by mining operatives does not need it for standard alert purposes. In the case of an emergency rescue situation, however, it might be needed to indicate to first responders the location of workers and whether they are under stress – giving rescuers not only the location of workers, but a potential priority order in which to respond. These indications require advanced algorithms, which operate at low power in embedded intelligence and are precisely what some of the devices now available attempt to deliver. It is clear that majority of smart watches deliver information in situations that are not life threatening, in which case reliability can be less of an issue. In protective apparel, however, reliability is a must and therefore a dedicated screening is necessary. It is clear also that high-end luxury smart devices are less adapted for protection purposes. Beyond measuring using advanced embedded processors, such devices allow communication capabilities. Communication is most often seen as the communication through a smart phone, the interconnection between the smart watch and the smart phone being assured through a short-range link, typically low energy Bluetooth, in which case the smartphone can take the communication relay. This approach is, however, only partially satisfactory. Protective apparel is worn in many cases in areas where the public mobile phone network is not available; for example, oil extraction platforms. According to the location, local networks based upon medium range communication systems such as wifi, short-range relay networks or even networks based upon industrial protocols can be engineered to transmit emergency information. It is certainly worthwhile to underline the rapid democratisation of smartphones. It is not only their capability of communication that is important, but it is also their considerable computing power, which can allow sophisticated algorithms to be integrated in a degree much higher than possible with the smart watch. Then elaborate and dedicated data fusion analysis algorithms can be embedded and, without external intervention, this can power the process of protection, recovery and saving if and when required. The evolution of smart textiles for monitoring of physiological parameters has continued in recent years. It appears that the huge trend towards smart watches somewhat shaded smart textiles, both in terms of commercial penetration and public visibility. Important evolutions have appeared, such as professional sports apparel equipped with smart electrodes. Incorporated into industrial protective clothing this kind of device would be very useful, particularly in very demanding and extreme conditions, where vital signs need to be continuously monitored. These electrodes allow measurement of physiological parameters, but most important is that some apparel even allows measurement of medical quality electrocardiograms. The initial market for this technology is sports professionals. The achievement should not be underestimated. The measurement in situ of an electrocardiogram along with the other more ‘classical’ parameters such as activity, respiration and core body temperature would be a real revolution in protective clothing, since it would allow monitoring in even more extreme conditions, secure the person in terms of continuous monitoring and rapid recovery and care in case of problems. Technological and commercial evolutions over the last years have radically changed the market of active wearable systems. The commercial changes are following three major directions. The first is the advent of commercial smart watches, which allow in a relatively unobtrusive way the monitoring of some physiological parameters, including activity. The second is the democratisation of smartphones, which are good and relatively low cost platforms that allow elaborate computing functions as well as communication capabilities, albeit with limitations depending on the type and location of work environment. The third is the evolution of some smart textiles. New commercially available apparel, while initially targeting markets unrelated to industrial protective clothing, offers exciting prospects for future development in this sector. In terms of technological developments three other main trends may influence the landscape of personal protection, all of which are related to large area components: photovoltaics and batteries for energy generation and storage, displays for human interface and sensing for monitoring external measurands. The protective apparel and related wearable systems have not been strongly influenced yet by these trends. We anticipate that, taking into account the importance of the technological and commercial evolutions of recent years, important changes in the industry are to be expected.